Diggers Valley: 26 July 2014. The week beginning the 26th of July 2014. The five of them arrived for lunch today and we had a ball together. It's such a bright and lovely thing to be in the company of staunchly feminist women! It's not that we convene a political meeting, but that our assumptions and view of the world are more closely aligned than any other company I generally meet in this rather conservative rural community. Glorious too, to meet again with some of the lovely women who were part of my own early feminist years. 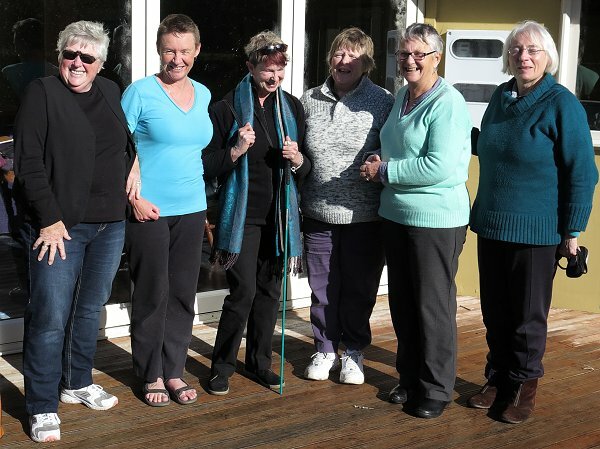 Pictured are Yvonne, Ruth, Elspeth, Lorraine, Josie and Sylvia. Except for Lorraine we were all participants in the first or early papers in the Certificate in Women's Studies, offered by the University of Auckland's Continuing Education Department in the 1990s. Silly Zella. 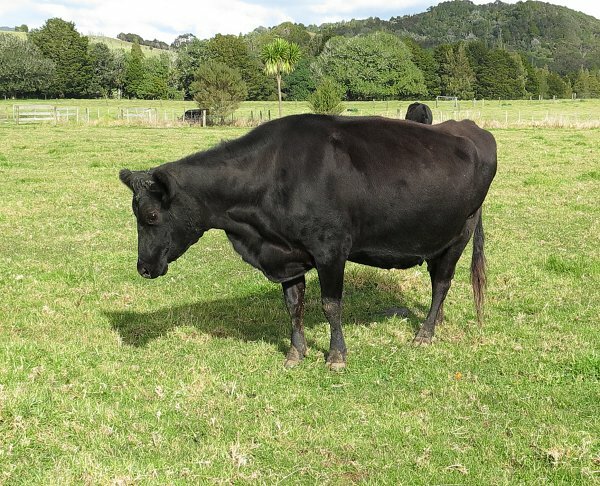 Cattle adopt this pose when they want to threaten someone else - each other or people. Several descendants of Ivy do this regularly, even though they know exactly who we are and are so tame we can scratch their ears. 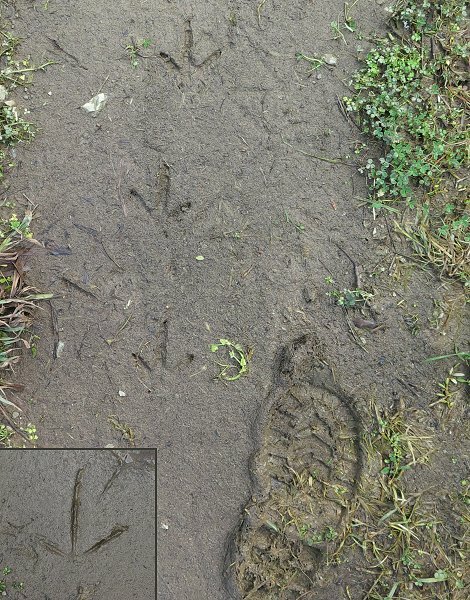 Kiwi footprints, along the Mushroom lane - and then I found a Pukeko print, resized to about the right extent, to compare. The Kiwi toes are quite fleshy and there's rarely much imprint from the "thumb" unless the mud is quite deep. Pukeko toes are far finer and longer and there's usually a print from the back claw. I've still never seen a wild Kiwi. 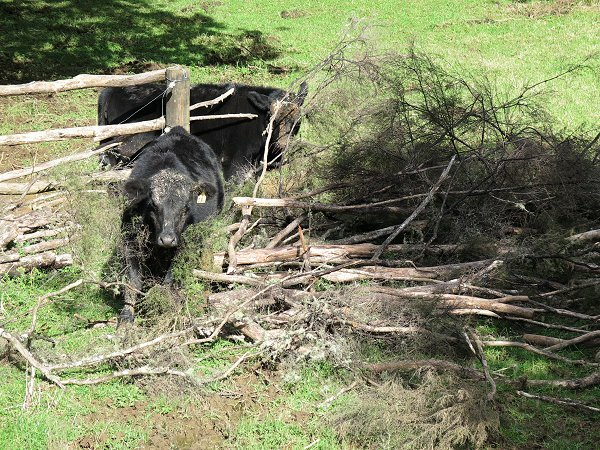 I called the heifers to move out of the Bush Flat again and most of them were milling around the tree Stephan cut off the fence after the storm. Several of them sensibly walked around it to come up towards me, but there's always a twit in the mix who will go the hard way. 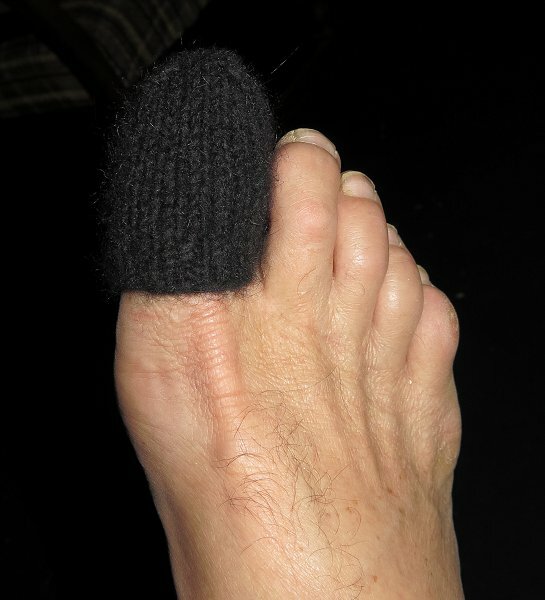 Stephan's toe was hurting on this cold evening, so I found my Possum/Merino wool, the yarn from which I knitted my warmest, favourite hat, and knitted him a toe sock. It took me about an hour and when he pulled it on, he said his toe felt all lovely and warm and stopped hurting. 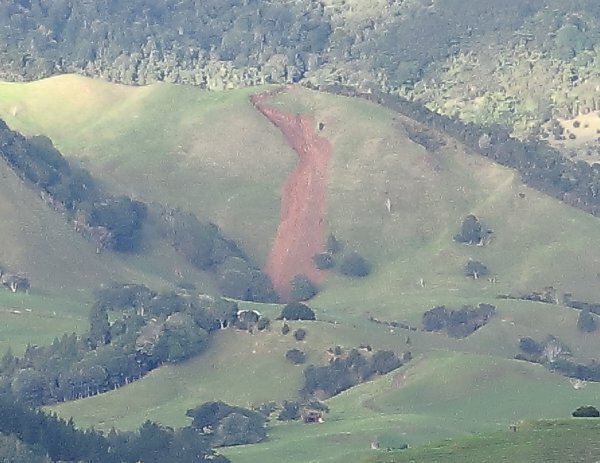 This is a higher view of the huge slip over at Te Rore Road, which I pictured a couple of weeks ago. 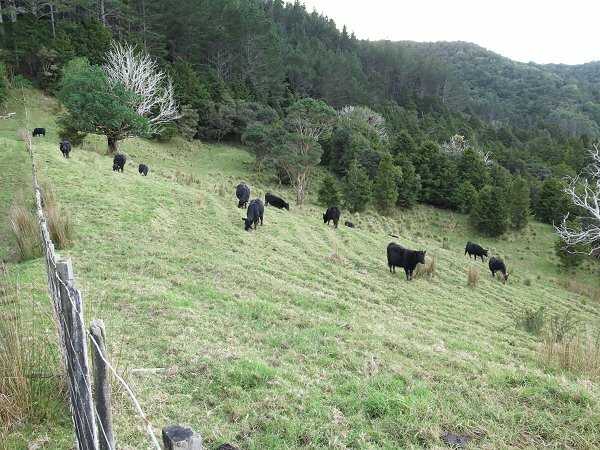 It's rare that in this paddock I can count all the heifers and know they're all safe without hunting for them in the trees. Feeling lazy, I counted them and walked back down the hill. Usually I go around them, checking rear ends for signs of trouble, but not always. For the first time in ages, I went and spent some time brushing my cows late this afternoon. I keep getting busy doing other things and don't go out and enjoy the animals as often as I used to. Off to Auckland this morning on a $25 plane ticket. My sister Rachel is going to Abu Dhabi for a teaching job in a week and Jude will hold her 40th birthday party early, on Sunday, to celebrate while we can all still be together. It's also Jill's birthday tomorrow and she thinks I'm going down for that. 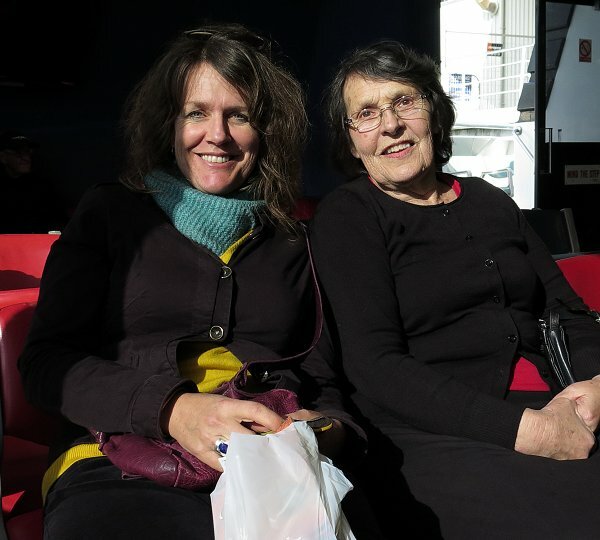 Rachel and I decided to take Jill for lunch over at Devonport, on the other side of the Waitemata Harbour, my thought being that she might remember something of it if we did something different from Jude's family's usual birthday afternoon tea at one of the local Hotel cafés. 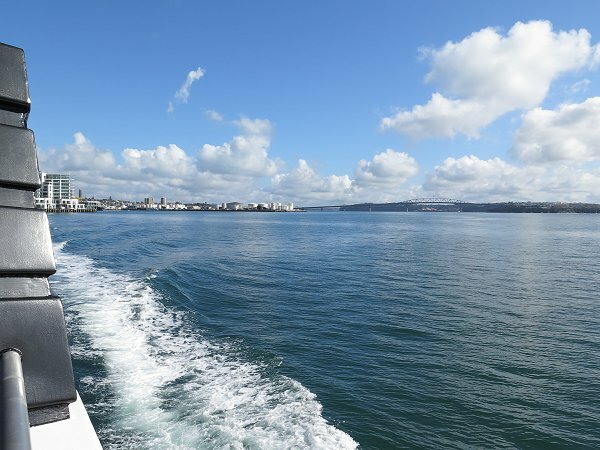 I'm not certain it worked, but we had a pleasant time with lunch at a café up the main street of Devonport and a wander around a few bookshops. There will be an end, before long, to pictures with Jill still in possession of some self-awareness, so it was nice to get some of Rachel and Jill together before Rachel leaves. I see no resemblance between us, but apparently everyone else can. I am somewhat more like my father than my sisters are, but Jill used to say she often saw characteristics of her own mother in my appearance. 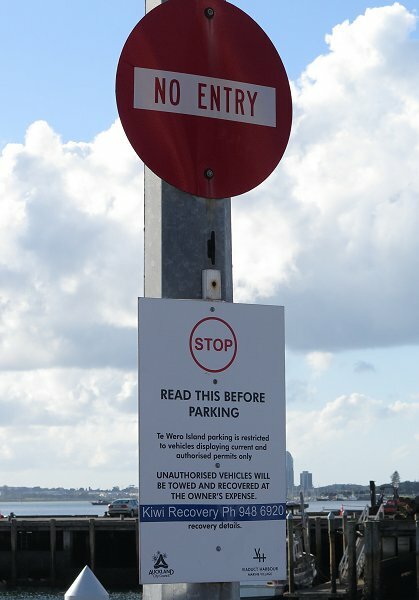 The first thing I noticed about this sign, before realising it was actually a parking sign, was the "Kiwi Recovery" bit at the bottom. Great, I thought, there must be Kiwi somewhere here someone is protecting! Aha! 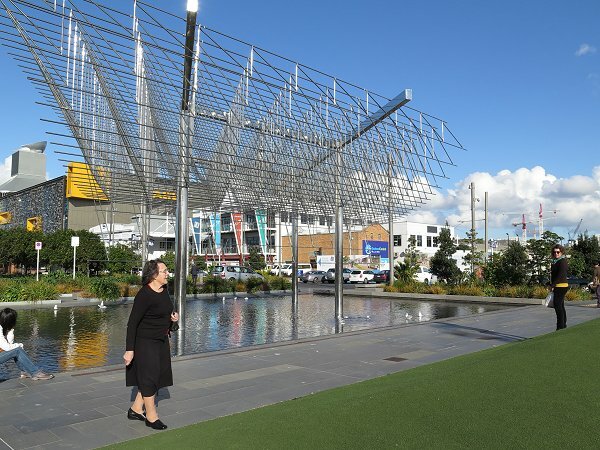 I've wondered for a long time where that sculptural structure went, after it disappeared from QEII Square at the bottom of Queen Street. I remember when it first appeared there during my childhood. I don't think I like it much, I'm just used to its appearance and missed its presence when it was removed. I spent my day doing things for and with Jill - hair-dresser for a long-overdue haircut, an overdue visit to the doctor, a maintenance visit to sort out some issues in her unit which had been left undone for a while. Jill is no longer really competent in looking after herself and has lost the cognitive ability to do even the most basic things. 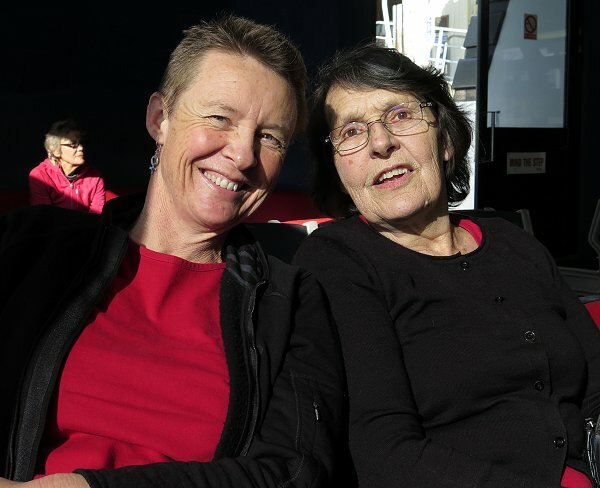 Jude and the care provider coordinator believe she will continue to live safely where she is with carers coming to visit her in her home up to three times a day, but the primary caregiver hasn't been doing a very good job for a while. Jill continues to tell everyone who comes to help her that she can do things for herself and because she's still so socially coherent, they believe her; but it isn't true. It will not be long before she will require residential care. It astonished me that one of the carers I met seemed to believe Jill just has a short-term memory problem. Alzheimer's Disease is full-on cognitive destruction! I listened to a radio discussion on the topic recently and someone suggested that if a test was available, nobody would want to take it, because you wouldn't want to know. The interviewee replied that for those who notice the cognitive and behavioural changes which come with Alzheimer's, a diagnosis is often a relief. From the perspective of someone whose maternal relatives have all apparently had the disease, I'd take a test to see whether my father's genes had saved me from a similar fate. It would be good to discover that I had nothing to worry about; a positive result (a negative outcome) would not change anything, except perhaps the likelihood of receiving treatment which might fend off expected changes, should that become possible.